The change in house prices was mixed in August, but continued the roughly 18 month pattern of stabilization. The Standard & Poor’s Case-Shiller House Price Index (HPI) eased slightly in August, with the Composite 20 (CS20) index falling 0.2% and the Composite 10 (CS10) index down 0.1% on a non-seasonally adjusted basis (NSA). (As noted in the past, when observing the Case-Shiller HPI attention should be focused on the NSA numbers). However, the FHFA House Price Index posted modest growth in August, up 0.1% on a NSA basis and up 0.4% on a seasonally adjusted basis (SA). The August results are the reverse of the July results, when the CS20 and CS10 were up and the FHFA index was down, suggesting the indexes will exhibit some monthly volatility as house prices continue the process of recovery. The August divergence in the HPIs is partially attributable to the periods covered by the indexes. 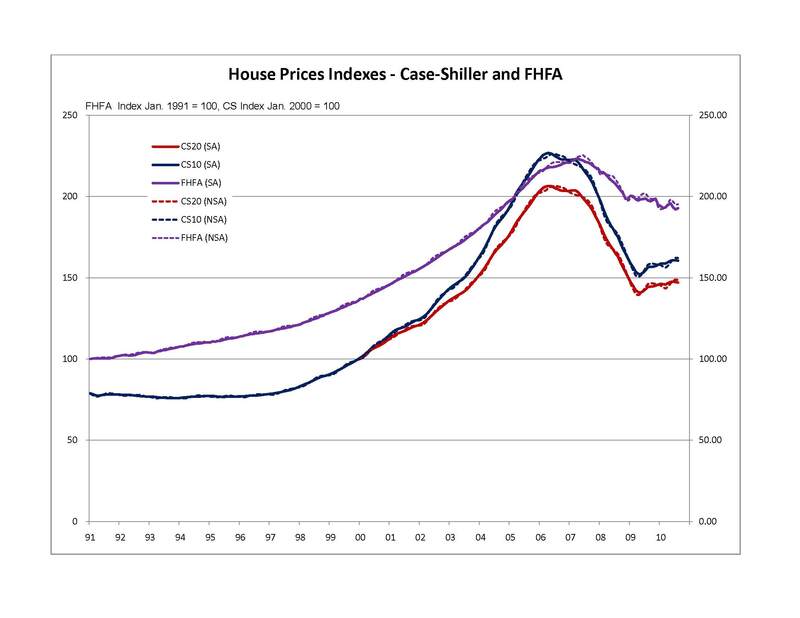 The Case-Shiller HPIs are a three month moving average of house prices, while the FHFA HPI is calculated monthly. Both use a repeat sales method, measuring the change in the price of the same property between two sales. The Case-Shiller August reading includes sales from June, July and August, while the FHFA observes only August sales. Therefore, the Case-Shiller HPI includes sales from before and after the expiration of the home buyer tax credit, while the FHFA index has shifted two months beyond this point. Price changes in the individual cities included in the Case-Shiller CS20 and CS10 indexes were mixed, both positive and negative, while the magnitude of the changes tended to be small. Prices fell in 15 of the 20 cities, with the largest declines observed in Phoenix AZ (-1.32%), Dallas TX (-1.13), Portland OR (-0.88%) and Atlanta GA (-0.85%). The strongest gains were observed in Detroit MI (0.52%), Chicago IL (0.42%) and Washington DC (0.26%). The increase in the FHFA HPI in August was a welcome sign, indicating that weakness in house prices following the expiration of the tax homebuyer credit will not be a major issue. An increase in the HPI was observed in five of the nine Census Divisions, with the largest rise observed in the West South Central (1.5%), East North Central (1.21%), West North Central (1.17%) and East South Central (0.77%). Slight declines were observed in the Mountain (-0.55%), Mid-Atlantic (-0.29%) and Pacific (-0.25%) divisions. Today’s house price numbers support our view that house prices will show some volatility through the end of the year, but will continue the trend of modest positive growth experienced since early 2009, with no further significant declines. As an early sign, the modest increase in the FHFA HPI in August reflects the beginning of recovery in existing home sales, which ticked up in August and strengthened in September. With housing demand expected to firm in fourth quarter 2010 and build momentum through 2011 and 2012, we expect these positive trends to continue. Bob Denk also contributed to this blog.